Huh, ok, no wonder everyone now suddenly wants plots at my place then! 2 updates to the OP about a hotfix and status of the footfall issue. As a developer this made me laugh more than it should I’m going to use this at work. Guess it’s time to close my portals and shop. Sure, all for stability! Just reset any and all timers with the next patch then for footfall, ok? Then we can see what it really should be like! But. As a thank you to your customers you just gonna add some more T5 and T6 planets, round them out per region (6 each, so 24 T5/T6 planets), that sorta thing, right? Right? Kidding aside, that planet idea is not even a bad one I think, hmmmm, would love to go exploring again, new planets, preferably in my own region, for farming/mining would be so gosh darn lovely! And heck, throw in some more great looking T4 planets as well! ohh, and T3! Yes! Make us happy waiting for a footfall fix! That is what could work! Keep us busy doing other stuffs! Can two beacons join the same settlement if they’re not touching? I have someone else’s road (1 plot) in between them. Baffled how to get them under one settlement. You can’t. Makes sense you can’t actually. Ask the person the road belongs too to change the road so it will also be part of the settlement then it will al be one! ok thanks - i thought this was the case. I’ll have to ask nicely then, as there’s no way around. Or if you’re lucky they might give you a road plot? I am sure a new grind will be added somehow to let you grind your missed coin back for the past 4 months footfall losses. one day we’ll get the ’ fun ’ patch and they will hotfix it labelling it the ‘you’ll need plastic surgery to remove the grin’ hotfix. For now though , the fun police are in force and they don’t give away coin for no reason. Or just let it roll and not worry about it for a couple days. Great time to build something and just relax! They’re working on it and, from what I can tell they are trying super hard to get a fix ASAP. What’s going on with the foot fall coin. I was getting a few hundred a day now nothing. Or like 40. I know I had at least one person in my store because something was bought but no coin to collect in the beacon…? Huh. … Everyone loves a good witch hunt!! Is there any news on the problem of the machines losing items or not doing the crafting? Read a post of someone losing what they had put in to craft, it was just gone. Went to craft some purified butter, put in 72 buckets of milk and when I went to check it said on second queue but didn’t show any content. Checked and nothing in content of what should have been purified butter. Cancelled and crossed my fingers I didn’t lose that milk, it is expensive to buy mild glands. Fortunately I got all the buckets of milk back. Others are having similar problems in crafting, don’t know if it is limited to ones with advanced coils or not. Or if it is using a alt to do the task. I re-plotted the mall and removed a few unneeded beacons. 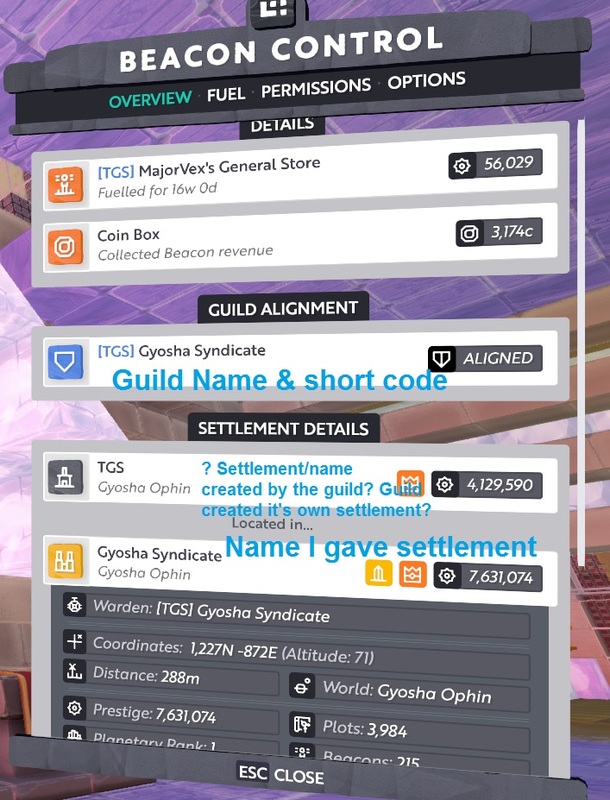 Expected result: All plots/beacons would now fall under the same settlement/city name, especially ones that have aligned to the guild. (except for settlements that have elected not to align to the guild, etc). Actual result: Existing beacon/plot areas retained the previous settlement affiliation, after removing/replacing/re-plotting beacons. They are remaining their own settlement, with the previous settlement name and won’t mesh. The neighboring plots that belong to people that haven’t been around in awhile, whose beacon/plots were part of the old settlement, seem to be retaining the old info and forcing neighbors to be part of the old settlement. If there was a problem with crafting as you describe I would expect to hear many players complaining. I don’t understand the problem here. Can you share the exact coordinates of the problem and beacons? If you’re using the Settlement Debug Visualisation it can take 1 minute to refresh the settlement alignment. Or a beacon is splitting via a road. I re-plotted the mall so that everything falls under Gyosha City - Gyosha Syndicate (City). There is now one beacon & one guild (if people want to join/align). It seems the Guild has created it’s own settlement? 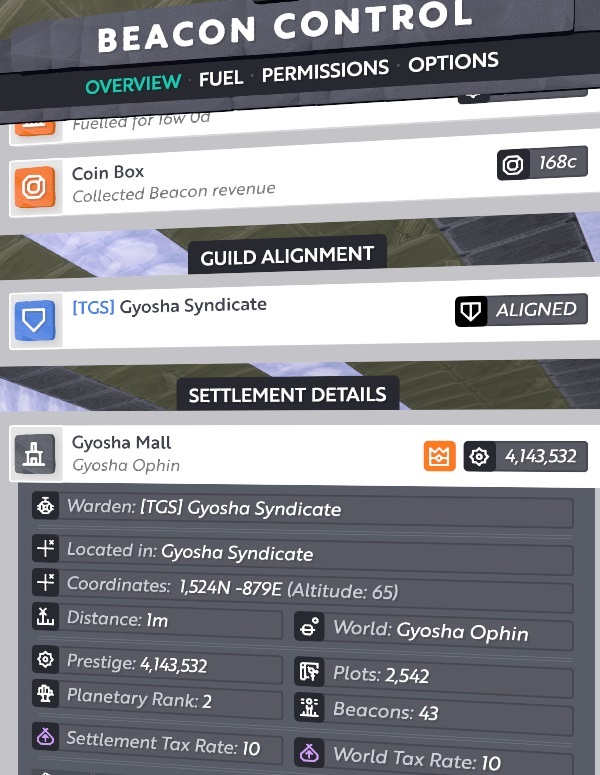 and that’s competing with my own main settlement: Gyosha Syndicate. 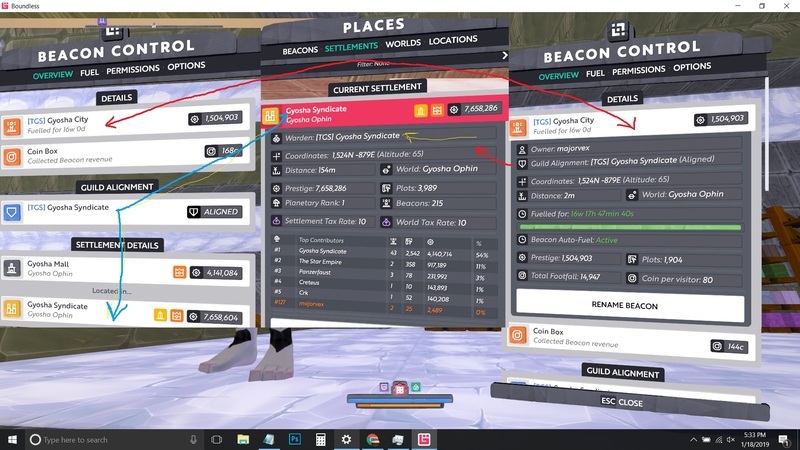 The settlement with 4.1m prestige has all its beacons (or just the one beacon) aligned with your Guild. That settlement is part of a bigger settlement (which you or the Guild are probably the warden of) in which not all the beacons are aligned with your Guild. I’m pretty sure it’s working as expected. You can rename the smaller settlement to whatever you want. I’m in a similar situation, I have Endor in the settlement of Greater Endor. I’m the warden of Endor and my Guild is the warden of Greater Endor, though in reality I’m the warden of both. There is one beacon in Greater Endor that I don’t own (Ultima planetary portal) and which isn’t aligned with my guild. All the Guild aligned beacons make one settlement, Endor, and they are part of a larger settlement which include them and the beacon owned by Ultima which isn’t aligned (Greater Endor). You could consider having your Primary Guild (Syndicate) and it can handle city streets + guild hall, then have a secondary Guild (Mall) that is just the Mall proper. You don’t need buffs in the Mall guild since its just for identity, therefore no one should need to have it as Primary. There is only one beacon for the mall & it’s aligned to the guild. One guild. Gyosha Syndicate [TGS] is the name of the guild, which has also become warden.